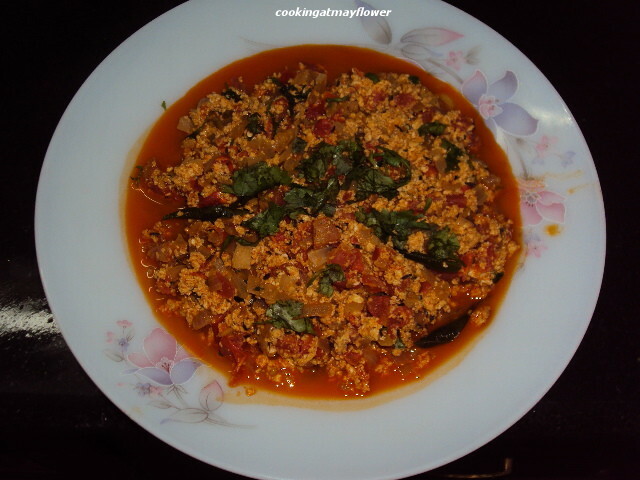 Mutta thilapichathu is a Kochi style egg curry. 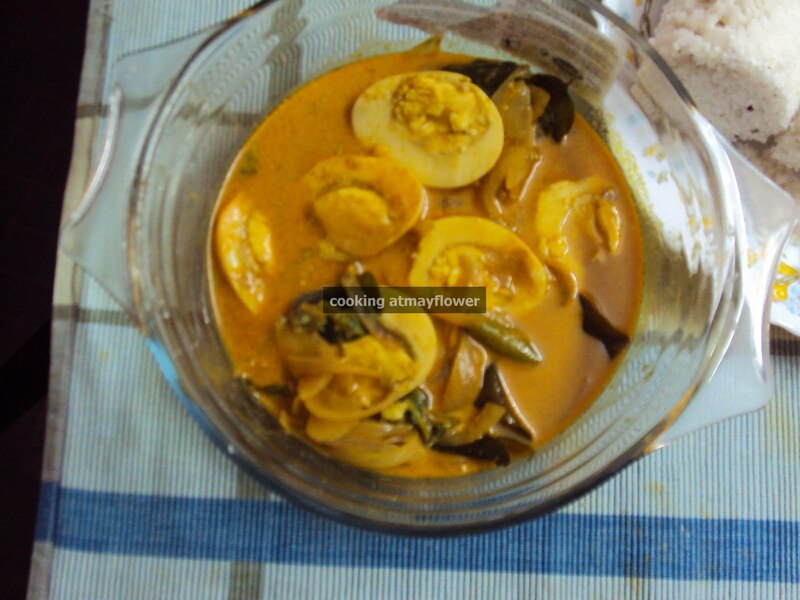 It is a very easy to make egg curry, which finds place in most of the Kochiites home. Heat oil in a pan. Add onion and curry leaves. Saute them. When onion turns light brown in color, add Kashmiri chili powder, chili powder and turmeric powder. Saute well. Add water and salt. When the water is about to boil, crack eggs and pour directly on to the masala. When curry starts boiling, lower the heat, close with a lid. When the yolk is just cooked, switch off the stove. Transfer this to a serving bowl. Note - Don't allow the eggs to cook for long time as it will turn rubbery and hard. You can add more water to reach your desired consistency level for gravy. Andhra style egg curry popularly known as kodi guddu pulusu is made by cooking boiled eggs in a tamarind gravy with spices. Heat 4 tbsp of oil in a pan. Add 1/4 tsp of turmeric powder and eggs. Saute the eggs by rotating the pan for 1 to 2 minutes. Once the eggs are well colored, drain and keep them in a plate. Heat 1 tsp of oil in a kadai. Add grated coconut and fry till light brown. Now add fennel seeds, cardamom, cinammon stick, cloves, peppercorn and fry till coconut is golden brown. When the coconut turns brown, add coriander powder, chilli powder and turmeric powder. Stir them. Immediately switch off the stove and transfer it into another plate. Leave this to cool down. Now transfer this to a blender. Add little water while grinding and grind them to a fine paste. Heat oil in a pan. Splutter mustard seeds. Saute onion, chopped ginger, garlic and curry leaves. When onion turns light brown, add ground paste, desired amount of water and salt. Bring this to a boil, add boiled egg. Cover with a lid and cook in a low flame. 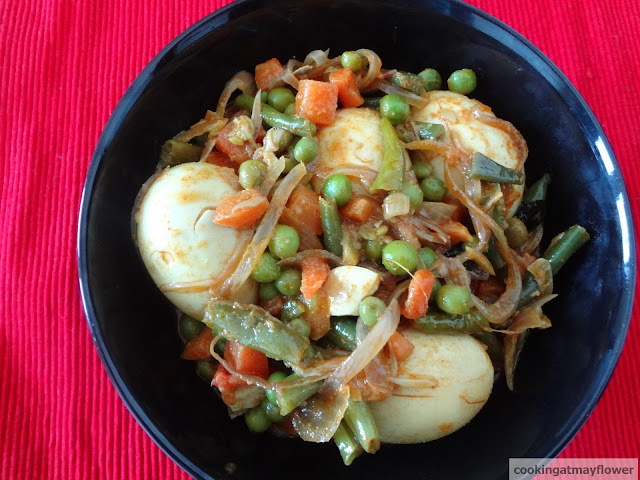 When the curry turns to a thick consistency, switch off the stove. Garnish with coriander leaves. Serve hot with Puttu, Idiyappam, Appam, rice, etc. Cook the eggs with salt. Remove the shell. Give vertical slits. Marinate eggs with salt, pepper powder and turmeric powder. Heat 2 tsp oil in a pan. Shallow fry the eggs. Set this aside. Soak kashmiri chilli powder, coriander powder, turmeric powder, pepper powder, and fennel powder in small amounts of water. Set this aside. Heat oil in a pan. Saute onion and curry leaves. When the onion turns light brown, add the soaked powders, and salt. Lower the flame and saute till the raw smell of the powder leaves. Add vinegar if required. Add the shallow fried eggs to this and mix gently till all the masala is well blended to the eggs. Switch off the stove. Serve hot with appam, idiyappam, and chapati. Eggs, boiled and peeled - 6 Nos. Dry red chillies - 5 - 6 Nos. Dry roast mustard seeds and fenugreek seeds. Add coriander seeds, cumin seeds and dry red chillies. Saute for 3-4 minutes on low flame. Remove from pan and set aside. In the same pan, add 1 1/2 tbsp oil and add sliced onion. Saute until lightly browned. Add turmeric powder, garlic and grated coconut and saute for another 2- 3 minutes. Turn off the flame and leave it to cool. Grind the dry roasted spices coarsely. To this, add sauteed onion-coconut mixture and tamarind. Grind this to a fine paste adding little water. Set this aside. Heat oil in a pan. Add ajwain, cinnamon sticks and curry leaves. To this, add sliced onion and saute it. When it turns light brown, add ground paste, which is set aside. Cook till the raw smell leaves. Add tomato pieces and mix. Saute them. Now add salt and potatoes and saute them. Add 3 cups of water and boil them. 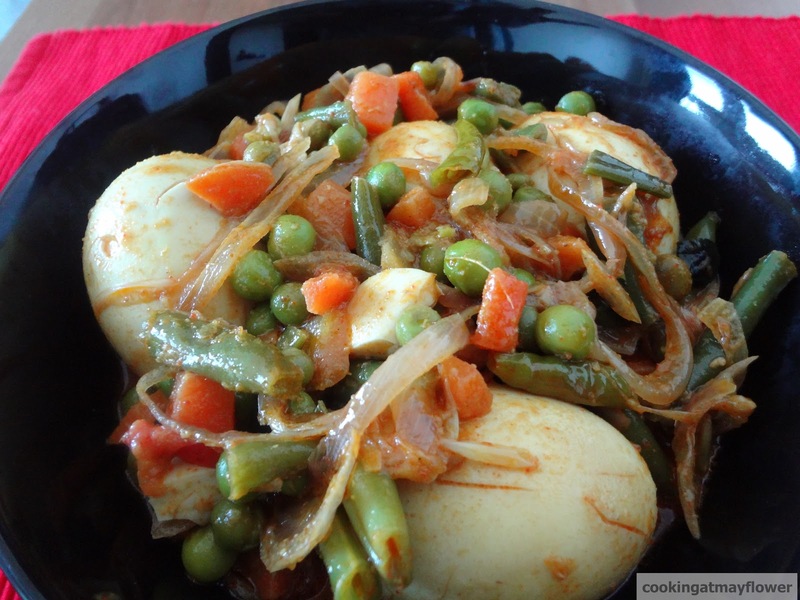 When the potatoes are cooked, lower the flame, add eggs and cook for 7-10 minutes. Add coconut milk and turn off the flame. Heat oil in a pan, saute cinnamon, cloves, bay leaves, and cardamom for one minute. Add onions to this and saute till transparent and soft. Now add ginger paste and garlic paste. When it starts giving a nice smell, add coriander leaves, mint leaves, and tomatoes. When tomatoes are all cooked and mashed, add chilli powder, turmeric powder, and garam masala. Add coconut milk along with 4 cups of water. When it starts to boil, add rice, salt and mix well. Put this on high heat for 5 mins and lower it till the rice is cooked and water is reduced. Pour some ghee and mix gently. Now add boiled eggs and serve decorated with eggs and coriander leaves. Serve along with pappad, pickle, and raita. Grind ginger, garlic, and coriander powder to a smooth paste. Set aside. Heat oil in a pan, saute onion, green chillies,peppercorns cinnamon stick, cloves, and cardamom. Now add the ground paste from above. Saute well. Saute the vegetables. Add thin coconut milk and salt to this. Cook the vegetables.When vegetables are cooked,add thick coconut milk. Switch off the stove and transfer it to a serving dish. Heat 1 tsp ghee in a pan, saute shallots and curryleaves. Pour over the curry. In a bowl, spread the boiled egg halves. Now pour the vegetable curry cooked from above. Serve hot with appam, Idyappam . Boil the eggs. With a knife, give slits. Keep them aside. Heat oil in a pan, saute onion. When it becomes translucent, add ginger paste, garlic paste, curry leaves and green chilly. Saute them well. Add coriander pdr, chilli pdr, turmeric pdr, and garam masala pdr. When the raw smell is no more, add vegetables, salt, and mix well. Add 1/4 cup of water and when vegetables are just steamed, add eggs. Now lower the flame. Close the lid, so that masalas blend together. When the gravy thickens, add thick coconut milk. When the coconut milk is about to boil (don't boil it). Switch off the stove. Serve hot with appam, idiappam, and chapati. Clean ridge gourd and cook with turmeric powder and salt along with some water ( use very little water) . Heat oil in a pan, splutter mustard seeds and curry leaves .Saute shallots , now add chilli powder and when the row smell goes, add grated coconut and stir well . When the grated coconut gives a light brown colour .beat the eggs and pour it Stir well so that lumps dont form. 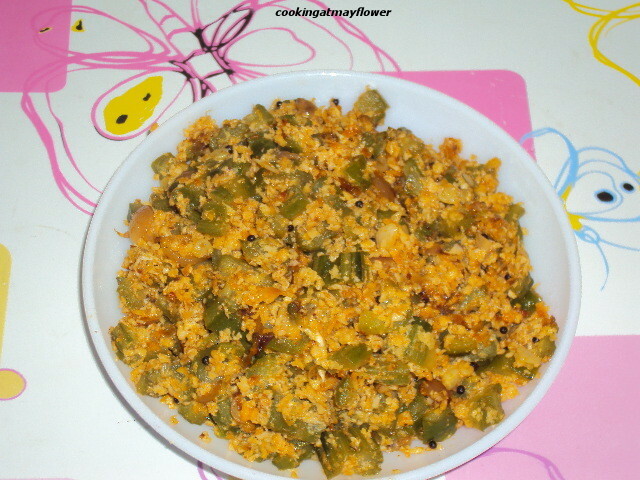 When the eggs get cooked, add ridgegourd to this and mix well. Turn off the stove when it gets the consistency of the thoran. Serve hot with rice . Heat oil in a pan, splutter cumin seeds. Add chopped onion, chilli, ginger and curry leaves saute well. When the onion turns brown in colour, add chilli powder ,garam masala, salt and saute well. 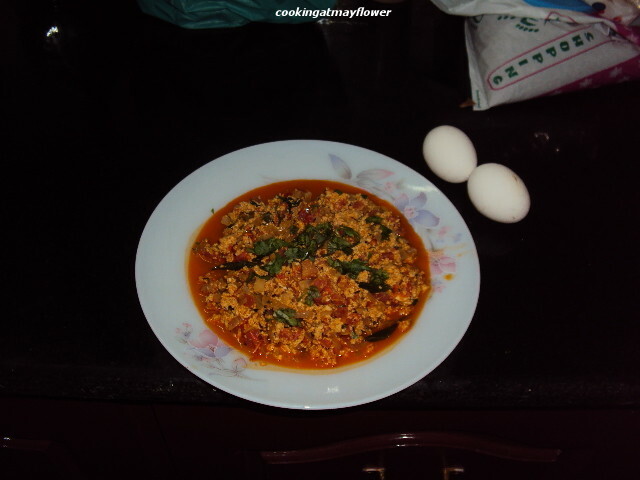 When the raw smell goes, add tomatoes and close the lid and cook When tomatoes are cooked , add eggs and scramble. If u need gravy add some water . Serve hot with chapattis, bread or rice. Boiled eggs cut length wise and simmer for 2-3 minutes. Cook beans with small quantities of water. Keep the cooked beans aside. Heat oil in a pan. Add pearl onions, green chilli and curry leaves. Fry till the pearl onions turn light brown. Now add chilly powder and fry for another ½ minute. Add cooked beans, salt, and mix thoroughly for a minute. Break eggs on to the cooked beans and fry till eggs are cooked well. 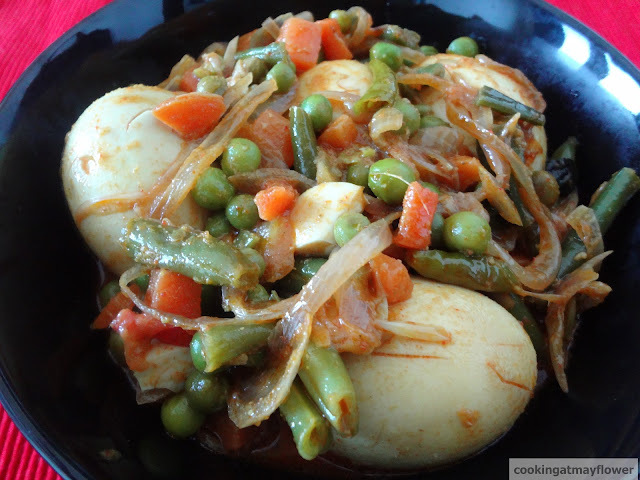 Serve hot with rice or chapatis. Heat oil in a pan, splutter the mustard seeds. Add ginger,garlic, and onions. Sauté till the onion become transparent. Now add ingredients 3, lower the flame and mix well till the oil comes out. Now add tomatoes and fry for 1 minute. Now add water as required and boiled eggs to this along with salt .once the gravy thickens add 2 tablespoons coconut powder dissolved in boil water.